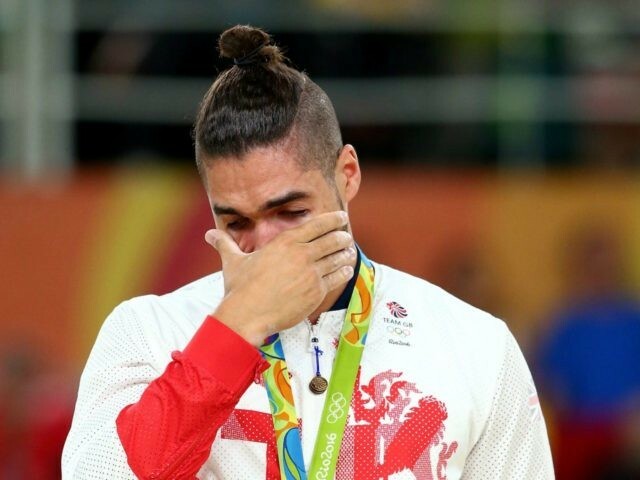 British Gymnastics said in a statement that Louis Smith and his former teammate Luke Carson were found to have breached the sport’s standards of conduct in a formal disciplinary proceeding. Mr. Smith and Mr. Carson were drunkenly filmed pretending to pray in an Islamic style at a friend’s wedding reception, whilst saying the Muslim phrase and war cry “Allahu Akbar” (God is greatest). The video sparked outrage when it was leaked to the press last month. Mr. Smith swiftly issued a grovelling apology and missed Britain’s Olympic homecoming parade to visit multiple mosques so he could “educate” himself about Islam. “The people and the community where [sic] so understanding and inviting”. “It is regrettable that following a historic summer of achievement, the organisation finds itself in this difficult position with two high-profile members in breach of our standards of conduct. “As the custodians of the integrity and values of the sport, we have had no choice but to act responsibly and refer this case to an independent Panel for their review and determination. Mr. Smith won a bronze medal and a silver medal on the pommel horse at the 2008 Beijing Olympics and the 2012 London Olympics respectively. A petition has already been launched, demanding the ban is lifted. “This is utterly absurd”, it argues, “Firstly, regardless of whether he was mocking Islam or not, why does that constitute a ban? “It is not illegal nor is it wrong to criticise or mock any religion, especially since this is meant to be a democratic country.